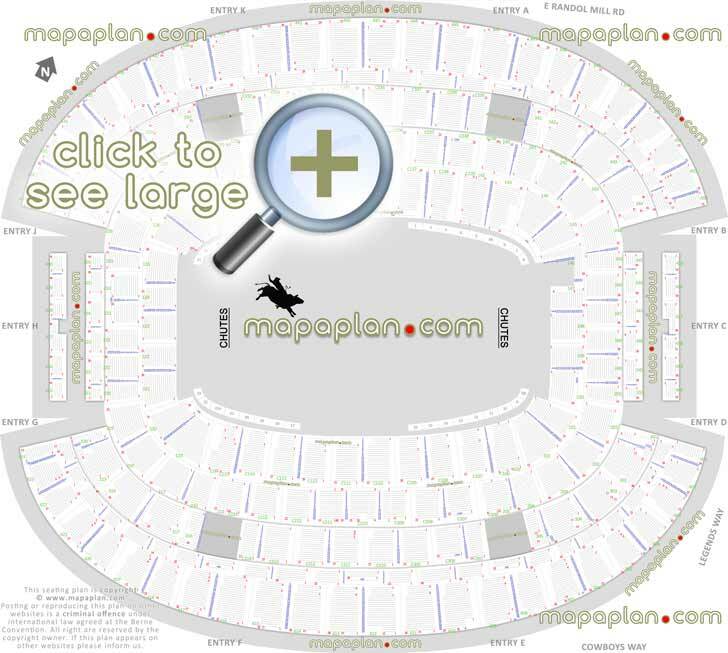 What are the best seats in the Dallas Cowboys AT&T Stadium in Arlington, Texas? 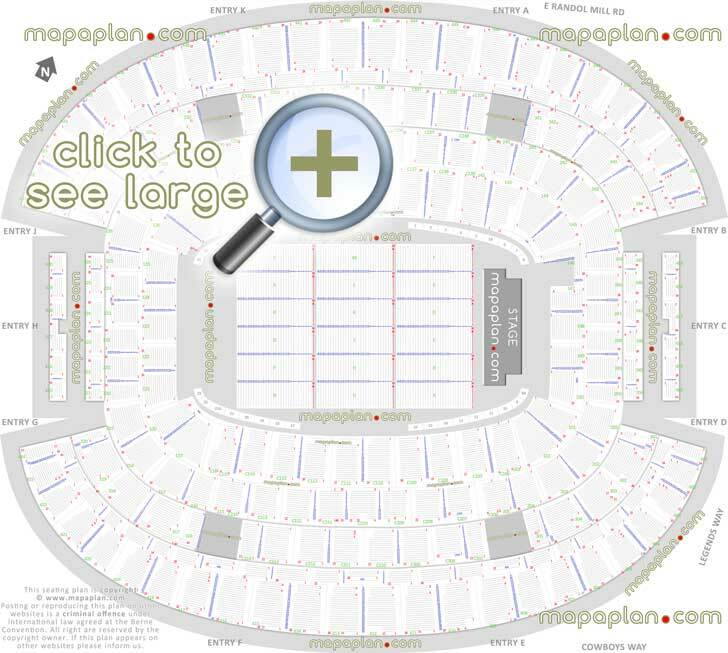 In the end-stage fully seated concert configuration the best seats in the Dallas AT&T Stadium (formerly Cowboys Stadium) are the first 10 rows in floor sections. The floor rows further back are OK however all floor seating is set on a flat floor so if a tall person is sitting (or standing) in front of you the view may be slightly obstructed/ restricted. The rows in the floor sections are typically numbered from 1 up to 30, whereas the seats are numbered from 1 up to 30, ascending right to left when looking at the stage. When buying your tickets you can use the venue seating charts on this page to find the individual seat numbers offering optimum central view of the stage. Please note that for some events the floor seats are rearranged and the floor forms a general admission standing section or sports area (e.g. Dallas Cowboys football or NCAA basketball). Surrounding the floor are Hall of Fame, Main, Mezzanine & Upper Concourse level sections numbered 101-150, 201-250 & 301-350, 401-460. These are set on inclined risers so even the back rows can enjoy an unrestricted view of the stage. The top seats in the Hall of Fame level are close to the stage in sections 107, 142, 139, 108, 138, 109, 137, 110, 136, 111, 135 and then 112, 134. In fact, these locations should offer much better experience than the back floor sections. Sections 115-128 offer a good, full view of the entire stage, however at a considerable distance so you will probably not be able to see the facial expressions of the performer. Row numbers are mainly from 1 up to 22 in lower Hall of Fame level; 1 up to 15 in the Main level; 1 up to 17 in the Mezzanine level; and 1 up to 30 in the Upper Concourse level. Seat #1 in the bowl sections is closest to the section with a lower number and seat numbering typically goes up to around 20-30 seats in each row. The exact seat numbers in each row are shown on our seating charts. What are the section numbers in the Dallas Cowboys AT&T Stadium, Texas? Floor sections - A, B, C, D, E, F, G, H, J, K, L, M, N, P, Q, R, S, T. Also for some events there may be additional floor sections, as well as Pit or General Admission standing areas. Hall of Fame level (lower level 100 sections) - 101, 102, 103, 106, 107, 108, 109, 110, 111, 112, 113, 114, 115, 118, 119, 120, 121, 122, 123, 124, 125, 126, 127, 128, 129, 132, 133, 134, 135, 136, 137, 138, 139, 142, 143, 144, 145, 146, 147, 148, 149, 150. For some events (e.g. football) the Hall of Fame Club sections may be marked with a letter "C" at the front - C106, C107, C108, C109, C110, C111, C112, C113, C114, C115, C132, C133, C134, C135, C136, C137, C138, C139. The home team bench is at the front of sections C109-C112, whereas the visitors bench is at the front of sections C134-C137. The rear of stage view, touchdown baseline, sideline and corner sections can be located on the seating charts above. For some events (e.g. basketball) there are additional sections at the front. Main level (level 200 sections) - 201, 202, 203, 204, 205, 206, 207, 208, 209, 210, 211, 212, 213, 214, 215, 216, 217, 218, 219, 220, 221, 222, 223, 224, 225, 226, 227, 228, 229, 230, 231, 232, 233, 234, 235, 236, 237, 238, 239, 240, 241, 242, 243, 244, 245, 246, 247, 248, 249, 250. For some events (e.g. 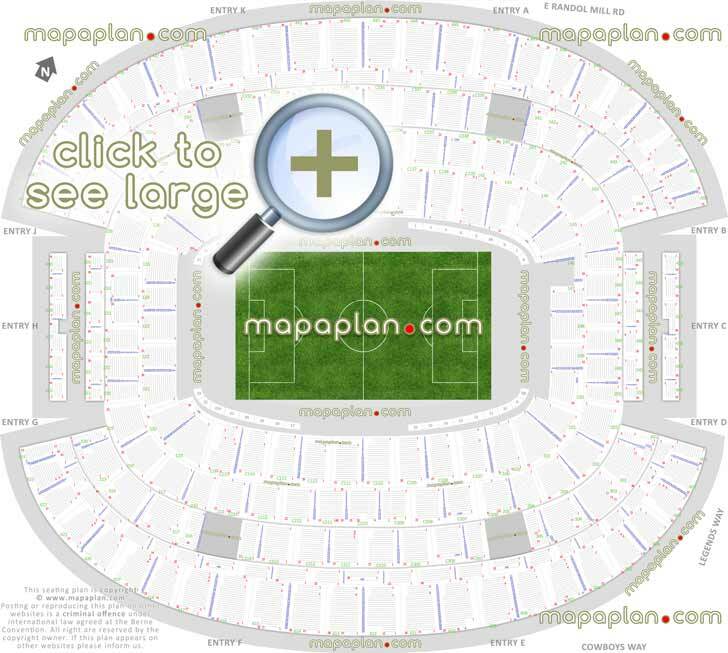 football) the Main level Club sections may be marked with a letter "C" at the front - C206, C207, C208, C209, C210, C211, C212, C213, C214, C231, C232, C233, C234, C235, C236, C237, C238, C239. Mezzanine level (level 300 sections) - 301, 302, 303, 304, 305, 306, 307, 308, 309, 310, 311, 312, 313, 314, 315, 316, 317, 318, 319, 320, 321, 322, 323, 324, 325, 326, 327, 328, 329, 330, 331, 332, 333, 334, 335, 336, 337, 338, 339, 340, 341, 342, 433, 344, 345, 346, 347, 348, 349, 350. For some events (e.g. 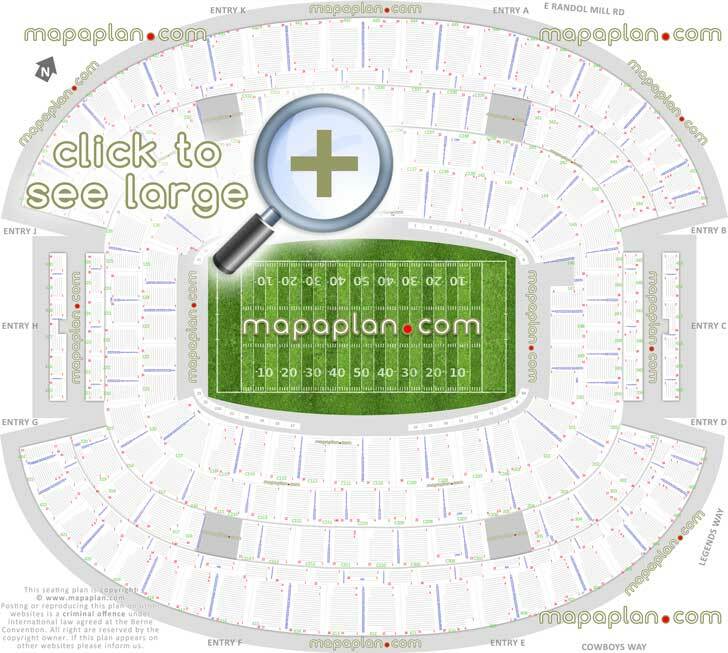 football) the Mezzanine level Club sections may be marked with a letter "C" at the front - C206, C207, C208, C209, C210, C211, C212, C213, C214, C231, C232, C233, C234, C235, C236, C237, C238, C239. Upper Concourse level (level 400 sections, upper tier balcony bowl terrace sections) - 401, 402, 403, 404, 405, 406, 407, 408, 409, 410, 411, 412, 413, 414, 415, 416, 417, 418, 419, 420, 421, 422, 423, 424, 425, 426, 427, 428, 429, 430, 431, 432, 433, 434, 435, 436, 437, 438, 439, 440, 441, 442, 443, 444, 445, 446, 447, 448, 449, 450, 451, 452, 453, 454, 455, 456, 457, 458, 459, 460. Field & Touchdown Event Level Suites - 1-31. Other facilities include: Field Clubs, Founders Clubs, Main Concourse Clubs, Silver Clubs, bars, restaurants, lounges, party deck suites, VIP loge boxes, main North, South, West, East entrance & exit gates A, B, C, D, E, F, G, H, J, K.
How many rows are there in the Dallas Cowboys AT&T Stadium, TX? Flat floor seating sections typically have rows from 1 up to 30. Hall of Fame & Club Hall of Fame level sections (101-150) have rows numbered from 1 to 22. Main & Club Main level sections (201-250) have rows from 1 to 15. Mezzanine & Club Mezzanine level sections (301-350) have rows from 1 to 17. Upper Concourse level sections (401-460) have rows from 1 to 30. 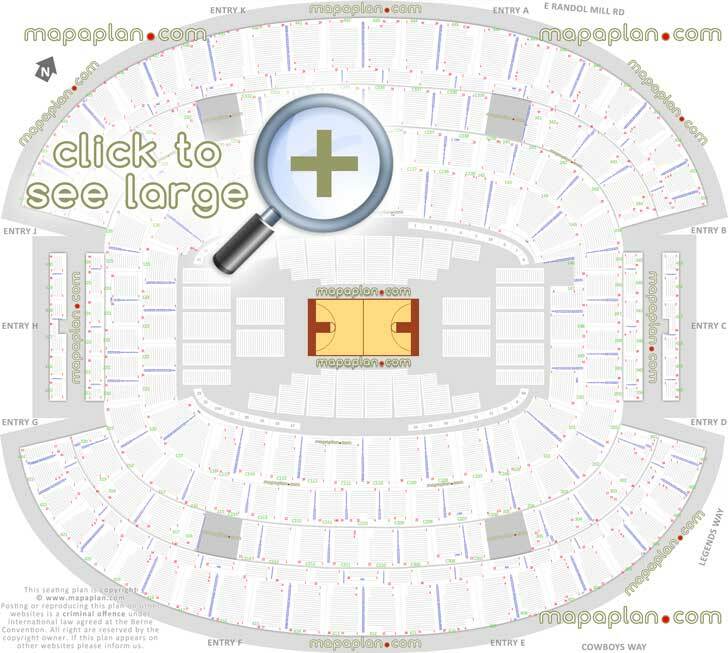 Additionally some sections may have accessible wheelchair rows (WC, handicap, disabled, ADA). The SRO (Standing Room Only) areas are located in West and East End Zones. 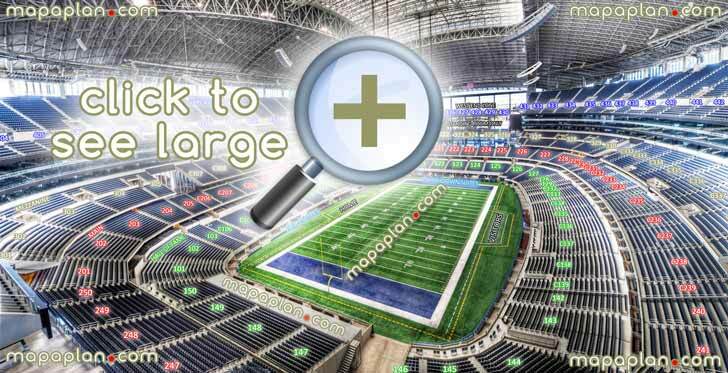 How many seats are there in a row in the Dallas Cowboys AT&T Stadium, United States? Flat floor seating sections typically have rows with up to 30 seats. Hall of Fame & Club Hall of Fame level sections (101-150) have rows with up to 33 seats. Main & Club Main level sections (201-250) have rows with up to 40 seats. Mezzanine & Club Mezzanine level sections (301-350) have rows with up to 43 seats. Upper Concourse level sections (401-460) have rows with up to 29 seats. What are some of the biggest shows that will take place or have taken place in the Dallas Cowboys AT&T Stadium, USA?